Fresh Products Disposal Fresh conveniently and rapidly cleans, freshens and boosts the performance of your garbage disposal. Our formula powerfully dissolves fatty deposits, food residue, and other odour causing build ups. Disposal Fresh utilizes new, pre-measured jumbo size disposal balls to make easy work of tough grime. It is incredibly easy to use - just drop it in, and let it do all the work. It will leave behind a clean and crisp orange-fresh scent. Disposal Fresh can be used once a week to keep you garbage disposal at maximum performance. It is safe to touch, no unwrapping is needed, and it uses no harmful chemicals. Disposal Fresh is environmentally friendly and biodegradable. Try our 2 Pack (2 Packages with 10 tablets in each package). What's growing in your bin? Effective all-natural COMPOSTGENIE eliminates odors and discourages pests from your green bin. Do your part for the environment while creating a safer, cleaner home. Include these organic granules as you add kitchen waste to your container or green bin to stop odors from forming. Millions of kitchens participate in green bin programs across North America. Compostgenie makes it easier, safer and cleaner. Keep valuable soil nutrients where they belong; out of landfills. Cleans and deodorizes most household surfaces and removes stains. Ideal for kitchen, bath and utility rooms, tile grout, fibreglass and hard plastics, basement walls and floors, garbage cans and diaper pails. 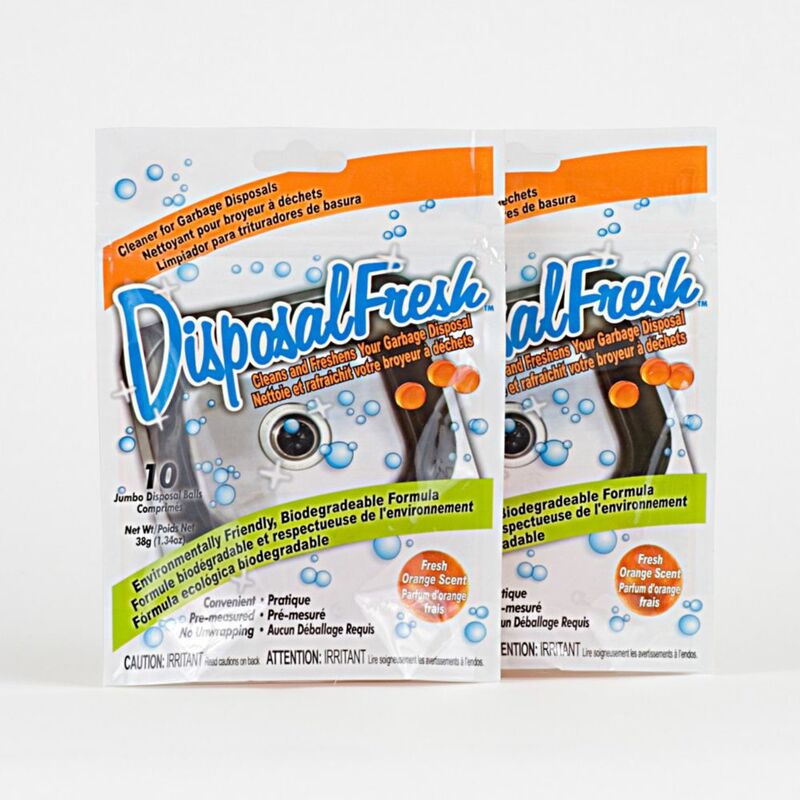 DisposalFresh Garbage Disposal Cleaner & Refresher - 2 Pack Fresh Products Disposal Fresh conveniently and rapidly cleans, freshens and boosts the performance of your garbage disposal. Our formula powerfully dissolves fatty deposits, food residue, and other odour causing build ups. Disposal Fresh utilizes new, pre-measured jumbo size disposal balls to make easy work of tough grime. It is incredibly easy to use - just drop it in, and let it do all the work. It will leave behind a clean and crisp orange-fresh scent. Disposal Fresh can be used once a week to keep you garbage disposal at maximum performance. It is safe to touch, no unwrapping is needed, and it uses no harmful chemicals. Disposal Fresh is environmentally friendly and biodegradable. Try our 2 Pack (2 Packages with 10 tablets in each package).